Without too much attention from traders, the SPY and QQQ are racing to attempt to establish new all-time highs in what may become the most exciting Spring/Summer breakout rally of the past 3 years. While many other symbols are still flirting with November/December 2018 highs, the SPY and QQQ are both showing upside price gaps last week indicating a moderately strong price advancement is taking place. Additionally, both the SPY and the QQQ are already well above early 2018 peak levels. If you were not paying attention, it sure looks like these two symbols are racing to be the first to break into “new all-time high levels” and shock the doomsayers (again) as we may see this rally continue for at least another 30 to 60 days. If you’ve been following our research, you’ll know that our short term research suggests new all-time high prices are imminent (very likely over the next 30 to 60+ days). We made this call back in September 2018 before the big selloff prompted by the US Fed. We also called the bottom on December 24, 2018, and warned that the subsequent rally would push hard in an attempt to target recent all-time highs. Now, as we near this event, we need to evaluate what may happen next. 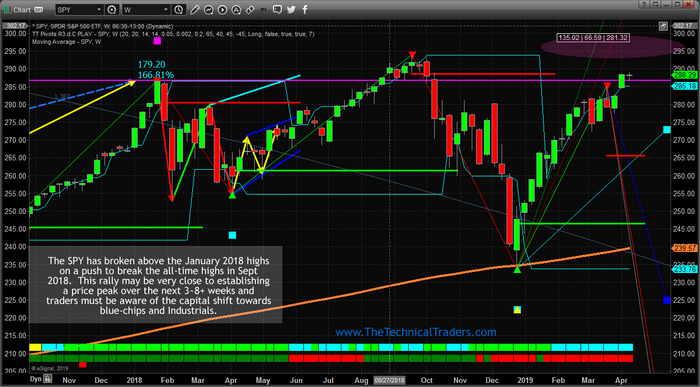 This SPY chart shows the weekly price bars and just how close we are to new all-time highs. The SPY only needs to rally about $8 to breach into new record-setting territory. We believe the upside rally could continue well above the $300 level as this upside price bias should last until late May or into early June 2019. Therefore, we could see an upside potential of more than 5~8% before a new peak sets up. This QQQ Weekly chart shows similar characteristics, yet shows one incredible variation to the SPY chart. 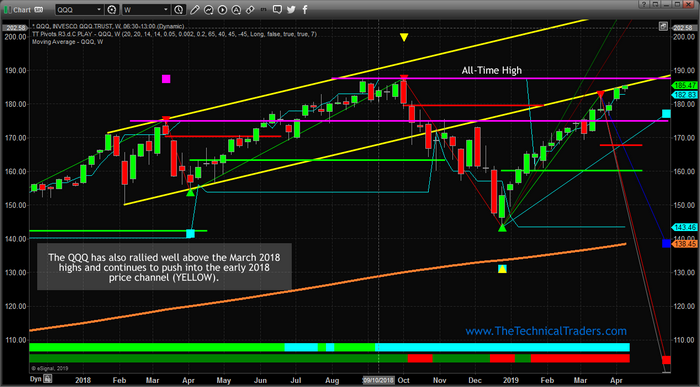 The QQQ chart shows that price is breaching the lower YELLOW price channel and this may result in an impulse move higher in the QQQ that could push it to new highs before the SPY. The QQQ is even closer to all-time highs than the SPY – being only $2.15 away from reaching the all-time high level. If this breach of the lower YELLOW price channel prompts a bigger rally, we could see the QQQ rally upward towards $200 to $210 before setting up a new price peak. This represents a +7.5% to +13.5% upside potential for skilled traders. If our research continues to be correct, we should expect at least another 30 to 60 days of upward price trend/bias before any real resistance sets up to potentially create a peak in price. 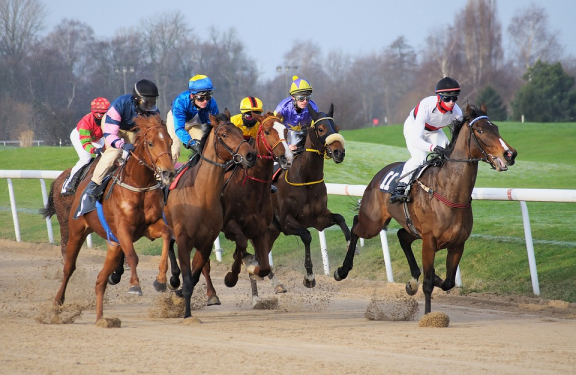 Our research suggests late May or early June 2019 is the time traders should protect open positions and prepare for extended volatility. Don’t wait for the ES, NQ, YM or TRAN to break the all-time highs. Watch the QQQ and SPY for this event and pay attention to the Russell 2000 and Blue Chips as they will likely be the early warning signs of a price peak or price weakness. We warned that price volatility will likely increase over the net 30+ days – so be prepared for some bigger price swings going forward as the bull and bears fight for control as we near these resistance areas. With a total of 55 years experience in technical analysis and trading between Brad Matheny, and myself Chris Vermeulen, our research and trading signals makes analyzing the complex and ever-changing financial markets a natural process. We have a simple and highly effective way to provide our customers with the most convenient, accurate, and timely market forecasts available today. Our stock and ETF trading alerts are readily available through our exclusive membership service via email and SMS text. Our newsletter, Technical Trading Mastery book, and Trading Courses are designed for both traders and investors. Also, some of our strategies have been fully automated for the ultimate trading experience.